Would you believe it! 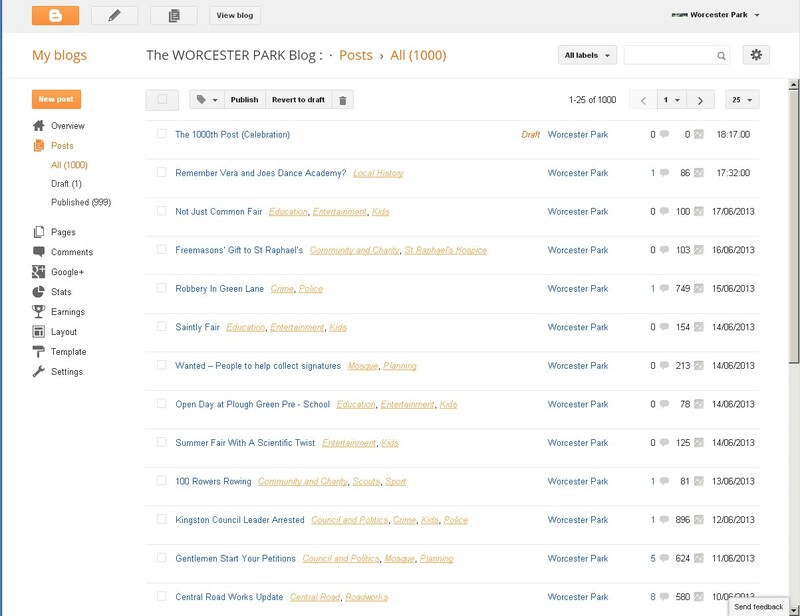 This little old Worcester Park Blog has hit the 1000 postings mark! That’s 1000 pieces of subjective and opinionated musings that you, dear reader have kept actually reading over the years. And it is only because you have kept reading them that I have kept writing them and keeping the blog going. So it is therefore all down to you, the blog readers, the Worcester Parkers who seem never to tire of my rantings, musings, gossip and other bits of information that I pick up from here and there, when most normal people would surely have chosen something much more interesting to look at. So I thank you. I really do. 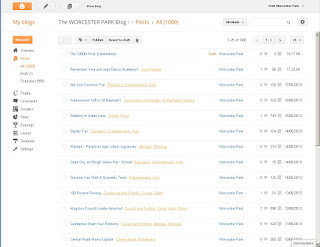 That such a blog can exist and even, dare I say ‘thrive’ here is perhaps a testament to the people of Worcester Park. And that gets me thinking: What is it that makes Worcester Park special? How is it possible that a random bunch of human beings that have only ‘where they live’ in common, can somehow form a distinct ‘character’? Is it something about what draws people here in the first place that everyone seems to somehow share or is it perhaps just the continuous little exchanges every day between the various Worcester Parkers as they go about their daily business that somehow passes on and continually refines the character of Worcester Park and the people who live here? Maybe it’s a combination of the two and other factors I haven’t even thought of. How have we managed to retain that villagy feel where people all seem to know each other without necessarily actually knowing each other, while physically being attached on all sides to the greater metropolis that is both South London and Surrey. Whatever it is, it is something worth appreciating. From a personal perspective I have to say how amazing it has been to write this blog knowing people actually bother to read it. And not just a few people but many people. Many times I have had to keep a straight face and just smile and nod while people have started randomly talking about the blog in my company. It has been recommended to me by people and hearing such unintended and unguarded praise has warmed my heart no end. It is such a great source of pride and also confidence and of course also a reminder of the responsibility that goes with it. Above all it has been (and still is) a great privilege. In celebration of reaching this 1000th posting milestone and to thank all of you who have stuck with the blog over the years, I have decided to organise an event which I am so tempted to call the ‘Blog Readers Ball’. It is nothing so fancy but it is a chance to get together, blogger and bloggees, to share a drink and a chat and see all the other blog readers we feel we know via our computers, but face to face and take the ‘virtual’ out of the virtual community of blog readers. It is also where *dum dum dum*, the true identity of the blogger shall be revealed. Yes I shall pull myself out from behind the keyboard and ye shall know who it actually is that writes all this stuff. At least ye shall know if ye turns up.